Know your audience. In fact, Forrester created a social marketing playbook, and the very first step is understanding and profiling your target audience. How do you know that your target audience is even on the social media channels you’re currently engaging with? Users on Snapchat are vastly different than those on Twitter, and they are used in completely different ways. To figure out your core audience, utilize the tools you already have. Facebook Insights and Google Analytics are both great tools and are no additional cost to you. And the most tried and true method: you can always ask your customer; they would love to tell you. Marketing spam is everywhere. In people’s mailboxes, inboxes and especially their social feeds. If you’re constantly getting bombarded with messaging that you really don’t care about, you’re going to start ignoring, and perhaps even block, the person or company posting that messaging. Don’t create content just to fill up a calendar. Think about the content you’re creating. Does it align with your marketing goals and objectives? Is it resonating with your audience? It’s okay to only create one to two posts per week, as long as your users are engaging with you. In fact, they will probably appreciate it. Based on Facebook, Twitter and Instagram’s ever-changing algorithms, your audience most likely won’t even see your post on their feed. Forbes recently wrote about these algorithms and what their constant changes mean to marketers. 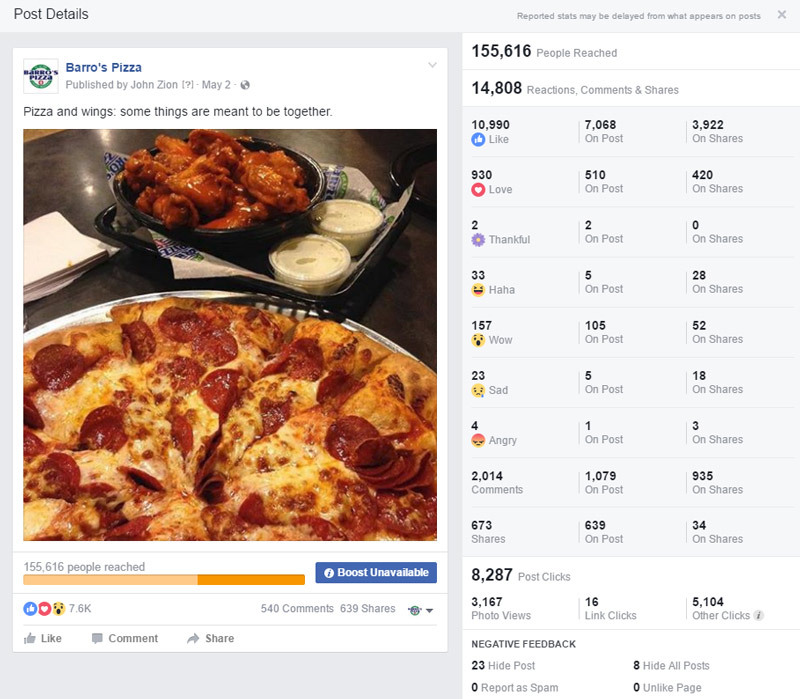 The gist is that you need to set aside a healthy budget to promote posts that really achieve your objectives and ultimately drive your business. Promote the posts that you know your audience will engage with. And if you have a limited marketing budget, don’t feel like you have to promote every single post – just the ones that really magnify your product and/or offering and embody who you are as a brand. Now that you’ve determined who your audience is and created a content strategy that aligns with your marketing goals and objectives, it’s time to find out if it is working. Understand which posts your audience is engaging with and which posts they are not. Are your posts too pushy? Are they authentic? We recently posted on behalf of our long time client, Barro’s Pizza, with a simple message, . The results were amazing. After just a week we reached over 150,000 people (over 96,000 of which were organic); had over 14,000 reactions, comments and shares; and the post generated over 8,000 clicks. It also achieved our marketing goal of creating top-of-mind awareness during that important window of time where our audience was deciding on what to eat for dinner. Your audience’s interests and focus are constantly changing. Producing the same type of content over and over again will eventually fall on deaf ears. Creating content that is relevant with what’s happening right now is crucial. Don’t be afraid to take some risks. We did just that with our client Venezia’s Pizzeria by playing off of the Pokémon Go augmented reality craze. As a result, we had 100s of fans reacting to the initial post within minutes. Like any other medium, social media is all about identifying who you are talking to, establishing quality content that achieves your marketing goals and objectives, and testing, testing, testing. At the end of the day, you want to create a relationship with your core user to become a true brand advocate. Having trouble getting started? At Zion & Zion, we’re here to help! Whether it’s B2B or B2C social media, we have extensive experience establishing a social brand and keeping it going long-term. Our client Childhelp, is a great example of a brand that came to us for help with developing a strategic position and implementation plan to grow their social media footprint. By identifying and engaging with their core audience, we were able to increase their organic (non-paid) average post reach by 249% and their organic average post likes by 1000%. Check out our Childhelp client case study for all of the details on that one.